Are you ready to take driving in the Irving, Grand Prairie, Grapevine, and Dallas area to the next level? Enter the Volkswagen Atlas. This SUV has been turning some heads on the streets—and for good reason. From a chic exterior to a fully-equipped interior, it can turn any commute into a full-fledged adventure. 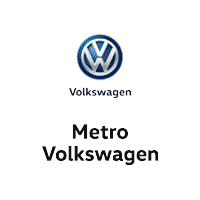 To help you learn more about this vehicle, Metro VW has created this 2019 VW Atlas review. Keep reading below to discover the performance specs, interior, available technology, and more. The progressive 4MOTION® is also available. This automatically dispenses power among your front and back wheels to better your traction depending on the terrain. Choose from four modes—Dry, Rainy, Snowy, and Rough—and you’re all set for steady and smooth driving. 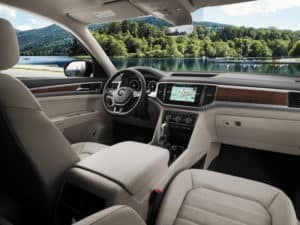 Inside the 2019 VW Atlas, you and your passengers are bound to be impressed. For the most lavish driving experience, opt for the premium leather seating surfaces with available heating elements throughout. Ventilated seats are also optional, so even when it’s warm, you’ll stay cool. A massive panoramic sunroof is also available, which spans almost the length of all three rows. With this stunning addition, you and your passengers can have a new view while on the road. It also lets you feel like you’re in a convertible! Just open it up and you’ll be able to feel the breeze throughout the whole cabin. Staying connected and entertained is easy with the advanced technology inside this 2019 Volkswagen Atlas. Along with the incredibly handy digital cockpit that you can personalize to display what info you find most important, the available Fender® Premium Audio System is also available. First, access your tunes on the dashboard touchscreen, then hear them like never before through this 480-watt system. You’ll also have a plethora of driving aids that offer you peace of mind. Driving assistance features can help you perfectly back out of parking spaces, keep a safe distance from the vehicle in front of you on the highway, and even allow you to see what’s in your blind spots. Now that you’ve read our 2019 VW Atlas review, it’s time to learn more when you visit our dealership, and the best way to do this is to drive it for yourself. To schedule a test drive in the Irving, Grapevine, Grand Prairie, and Dallas area, contact our lot today! *20 city/26 highway mpg (2019 Atlas 2.0L, 8-speed automatic transmission). EPA estimates. Your mileage will vary and depends on several factors, including your driving habits and vehicle condition.